Jody Osmund of Cedar Valley Sustainable Farm in Ottawa, Illinois, is a co-founder of Band of Farmers, a coalition of Community Supported Agriculture (CSA) farmers in the Chicago region. He writes here about the annual Farmers Talent and Fashion Show that takes place tomorrow (Saturday, March 28) night at The Hideout, located at 1354 W. Wabansia St. in Chicago. 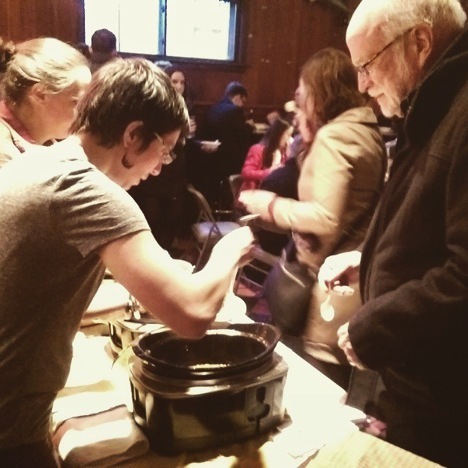 It has been a busy couple of weeks for Band of Farmers, our budding coalition of Community Supported Agriculture (CSA) farmers in the Chicago region. 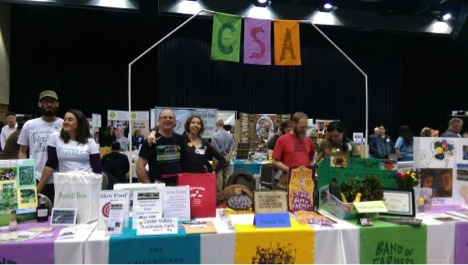 A launch of our new website… participation in the Opening Symposium on Trade Day at FamilyFarmed‘s Good Food Festival & Conference… then the CSA Pavilion at the Good Food Festival… then a soup & bread fundraiser for a great organization. But more about that in a moment. First, we have an urgent invitation to make. We are throwing a big party tomorrow (Saturday, March 28): the Band of Farmers Talent and Fashion Show at The Hideout in the Bucktown neighborhood of Chicago. This show is the most fun a farmer (and a fan of farmers) can have without playing in the dirt. If you’d like to see farmers letting their hair down and being silly, we encourage you to come on out! And if you already are a close friend of FamilyFarmed — bonus! If you attended the Good Food Festival, bring proof that you were there (just reprint your Eventbrite ticket from your email archive) and get in for $5. That is two-thirds off the normal cover of $15! All proceeds will go to Band of Farmers, a non-profit organization that works to advance the interests of CSAs and their customers. Here are some photos from past Farmer Talent shows. The Band of Farmers is ready for a celebration itself. After months of work by our steering committee — farmers and local food supporters — and our project coordinator, the Band of Farmers website went live in early March. Next up was the Good Food Festival & Conference. 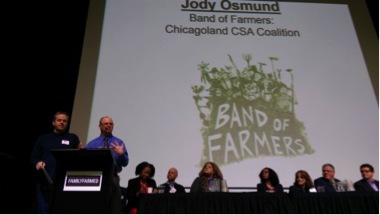 Steering committee co-chairs Jody Osmund and Tom Rosenfeld spoke with excitement at the Opening Symposium of the Trade and Policy Conference on March 20 about growing an education, awareness, and outreach hub to take Community Supported Agriculture to a new level in the Chicago-land area. 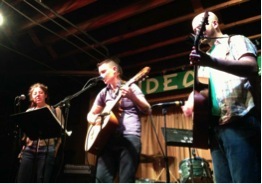 On Saturday, they (along with a bunch of other CSA farmers) were back for the Band of Farmers CSA Pavilion. Farmers got to chat with old and new farmer friends as well as tell their CSA story to hundreds of people coming to the fest to learn more about local foods. And this Wednesday, Band of Farmers were back in the city, again, serving up delicious soups for a good cause at Soup & Bread Chicago, also at The Hideout: $1,036 was raised on that night and will go to help nutritional support services for Vital Bridges, an organization that assist people affected by AIDS or HIV. To learn more about CSAs and Band of Farmers, click here to read a column written by co-founder Julia McDonald for Good Food on Every Table that was published March 5. Come join our party Saturday — and consider subscribing to one of our great CSAs with the region’s growing season right around the corner! This entry was posted in Community Supported Agriculture, CSAs, Direct Farm Marketing, Farm businesses, Food Entrepreneurs, Good Food business development, Good Food Festivals, Good Food marketing, Local Food, Regional food systems, Small Farmers, Sustainable food systems and tagged Band of Farmers, Community Supported Agriculture, CSAs, Direct Farm Marketing, FamilyFarmed, Good Food Festival, Good Food Festival & Conference, Good Food movement. Bookmark the permalink.